Commvault (NASDAQ: CVLT), a global leader in enterprise backup, recovery, archive and the cloud, today announced that its eleventh version of its solutions portfolio (v11) – Commvault Software and the Commvault Data Platform – has achieved SAP-certified integration with the SAP HANA® platform on IBM® Power Systems. The Commvault Data Platform provides customers with an underlying data management infrastructure to better protect, manage and process more data faster, lower operational costs, avoid business disruptions, and increase speed to innovation. 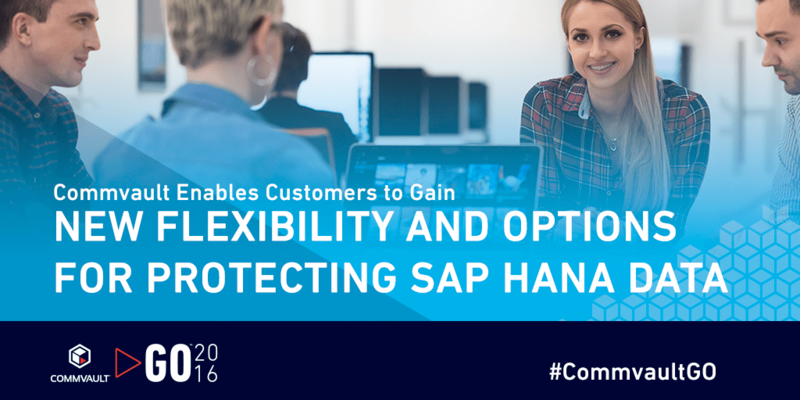 As a result, customers can improve IT efficiencies and gain greater business value from their data running in SAP HANA. A long-standing SAP partner, Commvault delivers automated backup and recovery of data in SAP HANA, including SAP S/4HANA® and other use cases and deployment types. Customers running SAP HANA can use Commvault Data Platform for rapid recovery, point-in-time recovery, fast spin-ups as well as refresh of development and test environments for SAP HANA or to create clone databases from snapshots with no production impact. The Commvault Data Platform is also tightly integrated with the SAP HANA studio and SAP HANA cockpit to support simple DBA self-service and monitoring of data protection tasks. With its native snapshot capabilities across the industry’s broadest selection of storage arrays, virtualization platforms and enterprise applications, the Commvault Data Platform empowers customers to implement modern data management infrastructures that optimize existing IT investments and turn data into strategic business value and insight. Today’s announcement comes in conjunction with Commvault’s inaugural customer conference, Commvault GO 2016, which brings together Commvault users, partners, employees, analysts and industry luminaries for three days of dynamic presentations, inspiring knowledge exchange and empowering networks opportunities. Keynote sessions are being held by Gartner’s Dave Russell, technology evangelist Robert Scoble, Microsoft’s Steve Guggenheimer, Cisco’s Satinder Sethi, ESG’s Steve Duplessie and critical thinker Adam Savage (formerly of Mythbusters).Attendees will also hear from technology evangelist, Robert Scoble, the event emcee, and ComputerworldROI magazine Founding Executive Editor, Julia King, who is moderating a panel focused on Computerworld’s Premier 100. Commvault GO 2016 is currently being held in Orlando, Fl. Participate in the conversation on Twitter with #CommvaultGO and by following@Commvault. The eleventh version of Commvault solutions portfolio is uniquely positioned to help customers activate their data by accelerating the transformation from legacy data management to a modern data environment to unlock critical business insight and drive new value from customers’ technology investments. The Commvault solutions portfolio is comprised of an industry-leading product offering in the areas of data protection and recovery, cloud, virtualization, archive, and file sync and share that addresses evolving market trends, growth areas, and customer use cases. The Commvault Data Platform is open and standards-based, helping customers better leverage data, improve IT operations, and enabling 3rd party innovation. Commvault is a leading provider of data protection and information management solutions, helping companies worldwide activate their data to drive more value and business insight and to transform modern data environments. With solutions and services delivered directly and through a worldwide network of partners and service providers, Commvault solutions comprise one of the industry’s leading portfolios in data protection and recovery, cloud, virtualization, archive, file sync and share. Commvault has earned accolades from customers and third party influencers for its technology vision, innovation, and execution as an independent and trusted expert. Without the distraction of a hardware business or other business agenda, Commvault’s sole focus on data management has led to adoption by companies of all sizes, in all industries, and for solutions deployed on premise, across mobile platforms, to and from the cloud, and provided as-a-service. Commvault employs more than 2,000 highly skilled individuals across markets worldwide, is publicly traded on NASDAQ (CVLT), and is headquartered in Tinton Falls, New Jersey in the United States.